Mechanical Pressure switches are most accurate in the middle of their range and can be 10-15% accuracy at the ends of the range. Pick a switch where your set point is in the middle of the range. The Barksdale D1T and D2T switches have 10 amp relays and are SPDT. These mechanical switches are highly reliable and can withstand many years of industrial use. 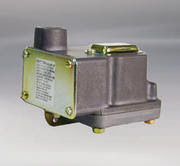 The pressure switches are UL and CSA approved. There are many different models and the catalog cut sheet can be seen HERE. The D1T switch is a single stage switch and the D2T is a two stage switch that can be set with 2 set points; a low and a high for example.